If you go down to the woods today, you’re in for a big surprise. 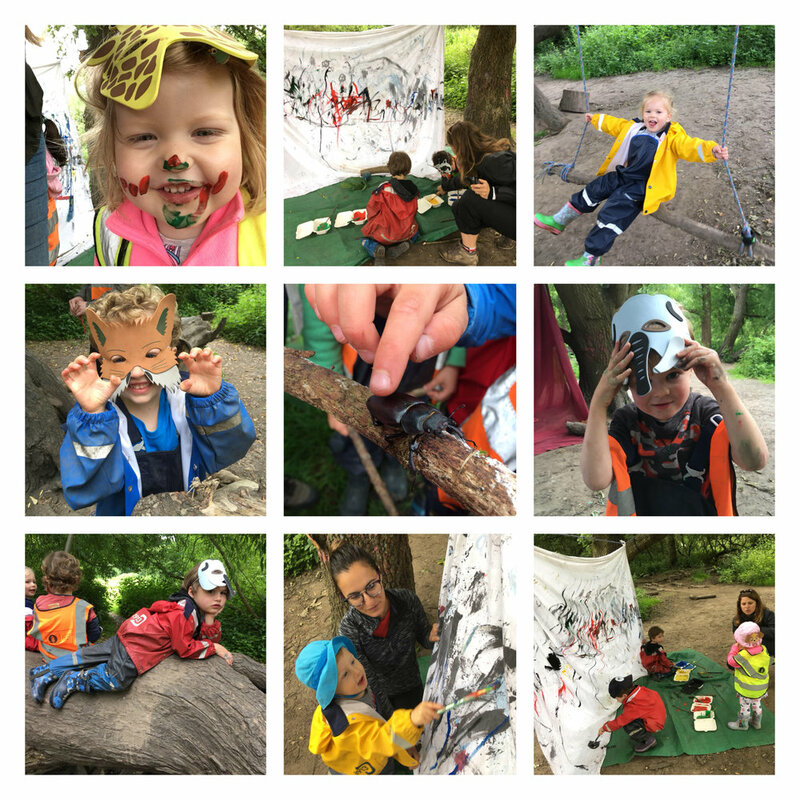 The Little Forest Folk-ers transformed themselves this week into a complete menagerie of different animals using masks, which produced some wonderful play and encouragement to try new things. Lions were seen climbing trees and growling from the branches. Flamingos and zebras supported each other in reaching new heights and meerkats bounced around. The masks spurred the children into building animal homes which became the focus of some lovely family orientated play. Adventure walks happened at least once a day, if not more, as the children were particularly interested in exploring the wider forest. Those that headed out discovered many new sights: the trout schools in Beverley Brook; herons keeping a close eye on them; banded demoiselles (a beautiful damselfly species) and even dinosaur bones! Alongside the exciting finds, the children constructed a large den which they decorated with string and bracken (to keep the rain off). The bracken leaves were also put to good use as a natural umbrella as the children headed back to the nursery site … despite their not being a drop of rain! 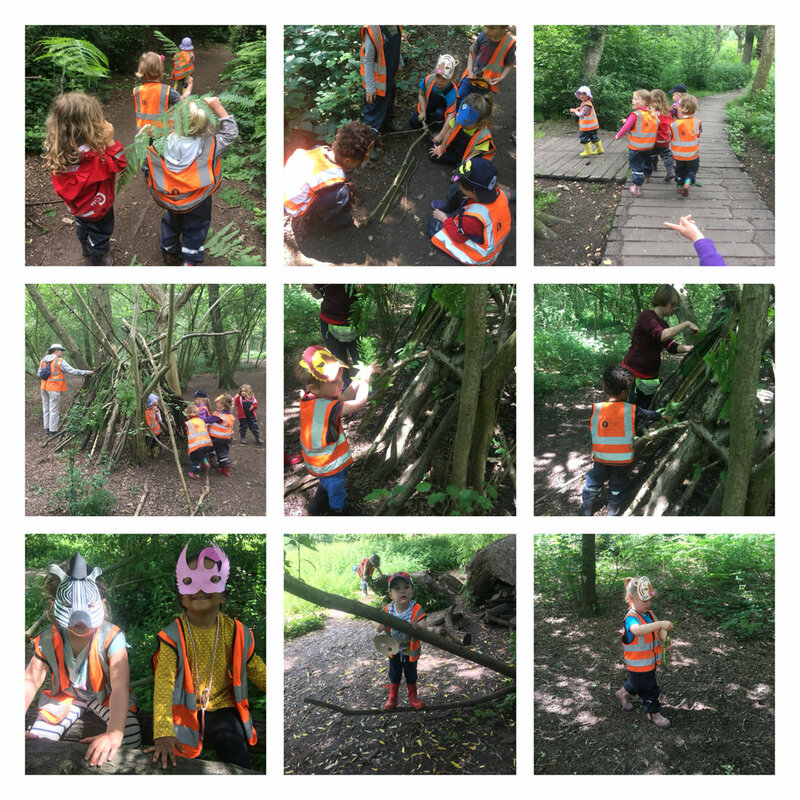 The children had very sharp eyes this week for spotting animals in and around the forest. A rare stag beetle revealed itself to the children in the morning on Monday and then a family of young rabbits had been seen happily grazing in plain sight of all the children as they walk in to the forest. The children enjoyed trying to spot the tell-tale signs of the rabbits! There have been new hairy caterpillars to watch on their journeys (the children know not to touch them as the hairs can cause the skin to become very irritated), smaller (but no less exciting) beetles such as shield bugs, and then the usual spread of creepy crawlies that inhabit our forest. Through their findings, the children always show themselves to be tremendously caring and inquisitive, handling the tiny creatures with gentle hands that return them to their homes once they’ve been thoroughly look over. Older PostWe're in the paper!